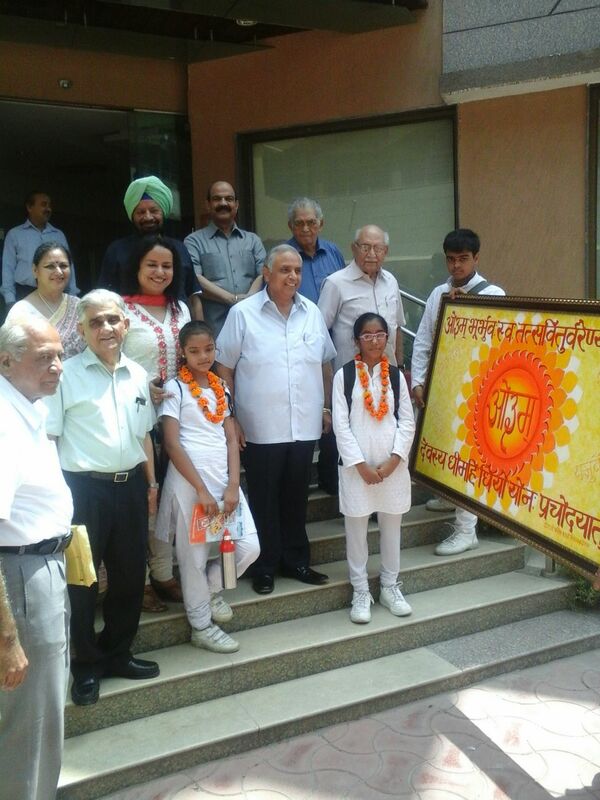 Student members of Arya Yuva Samaj of DAV Public School Dwarka recently participated in a Vedic Programme held at Arya samaj Mandir,Anarkali, Mandir Marg, Delhi . Sh. Punam Suri, President DAVCMC and the office bearers Sh. R.N. Sehgal , Sh. Ajay Suri, Sh. J.K Kapoor, Sh. Ajay Sehgal, Sh. H.L. Bhatia, Brigadier Adalakha Mrs. Sneha Mohan graced the occasion and blessed the students . 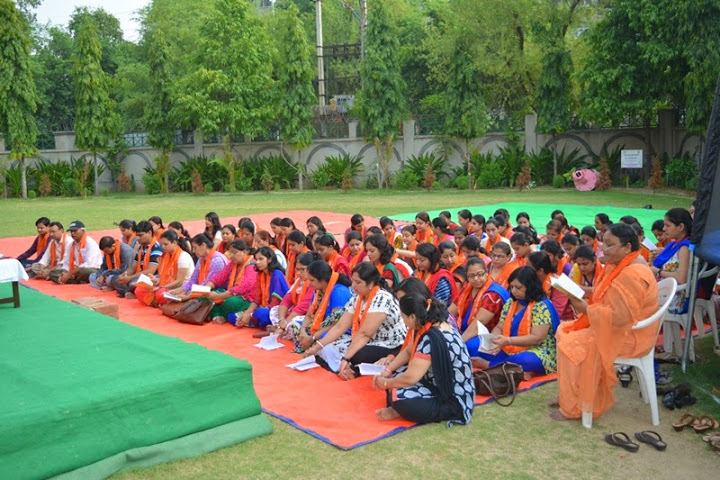 The programme commenced with Hawan in which school students offered their Aahutis amidst chanting of vedic hymns. The combination of the powerful energy of the sacred fire and the sacred mantras created immensely auspicious and purifying vibrations in the environment. 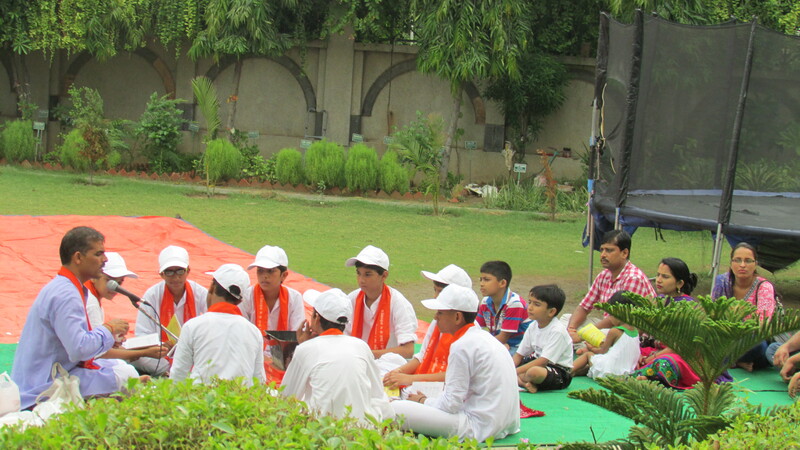 After the sacred hawan children serenaded devotional songs and bhajans . Big Placards’ imprinted with vedic mantras in English and Hindi placed along the passage from the Entrance to the Conference Hall added to the décor of the ambience. Entrance and the entire passage was appealingly adorned with flowers and Rangoli patterns. A melodious rendition by students on the famous song “Aaj sab mil ke geet gao us prabhu ke dhanyavad” written by Sh. Amichand, one of the favourite disciples of Swami Dayanand, left everyone bliss full and spellbound. The audience was found in a spiritual and reflecting mood as two students chanted vedic mantras and gave their musical Hindi and English interpretation simultaneously. The majestic melody of songs in the glory of almighty imbued every one with devotional fervor and charged the atmosphere with divine adoration. As a part of our commitment towards a healthy and happy environment, the Interact Club of D.A.V. 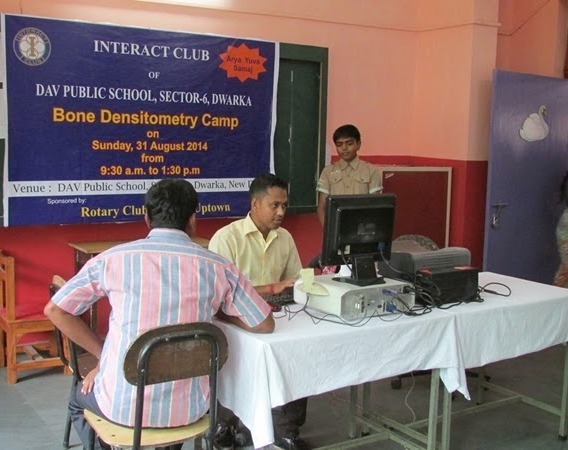 Dwarka, sponsored by the Rotary Club of Delhi Uptown organized a Bone Densitometry Camp on Sunday, 31 August 2014 in the school premises. It was free of charge. 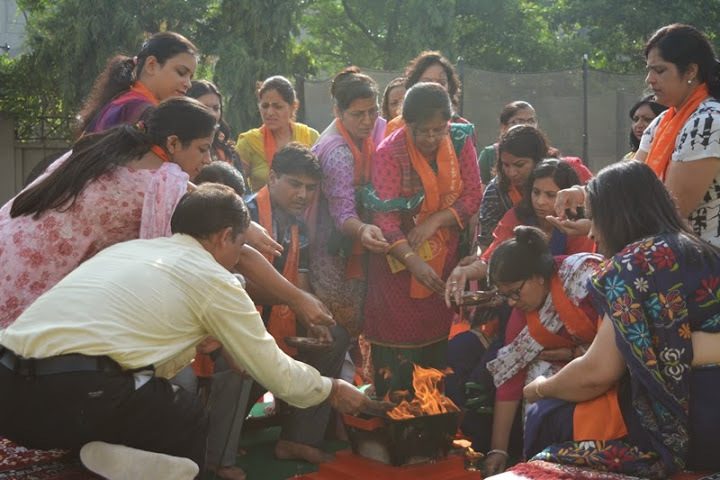 The campaign was planned with the intention to create awareness about the importance of our bones and to shed light on prevention of Osteoporosis, a disease which is a silent killer.The day commenced with a ‘Hawan’ arranged by the members of the ‘Arya Yuva club’. Students, parents and teachers participated in it. The Bone Densitometry test was conducted in the junior wing of the school. Despite heavy rain, the camp witnessed an overwhelming response. Over 200 people turned up to get their bone health checked. 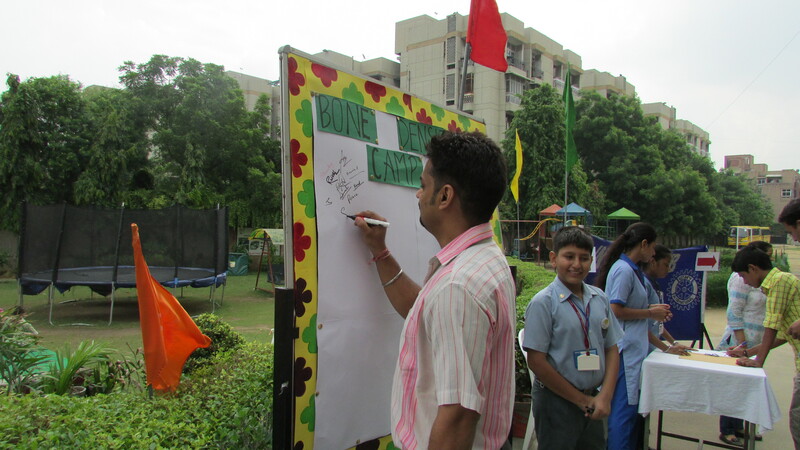 A signature campaign was also carried out in support of the cause. Along with the office bearers, the members of the Interact Club, and the members of the Arya Yuva Club, acted as volunteers. The credit of the resounding success of the camp goes to the volunteers who worked tirelessly throughout the day motivated by the Principal of the school Ms Monika Mehan and supported and guided by the Interact club co ordinator and its teacher members. Weekly Hawan was performed by Arya Yuva Samaj on Wednesday September 3rd for the students of class X. All students accompanied by their class teachers participated in it with immense devoutness and sanctity. Special blessings and grace were sought for the students whose birthdays fall in the month of September by offering “Aahuti” in the sacred fire amid chanting of vedic mantra. 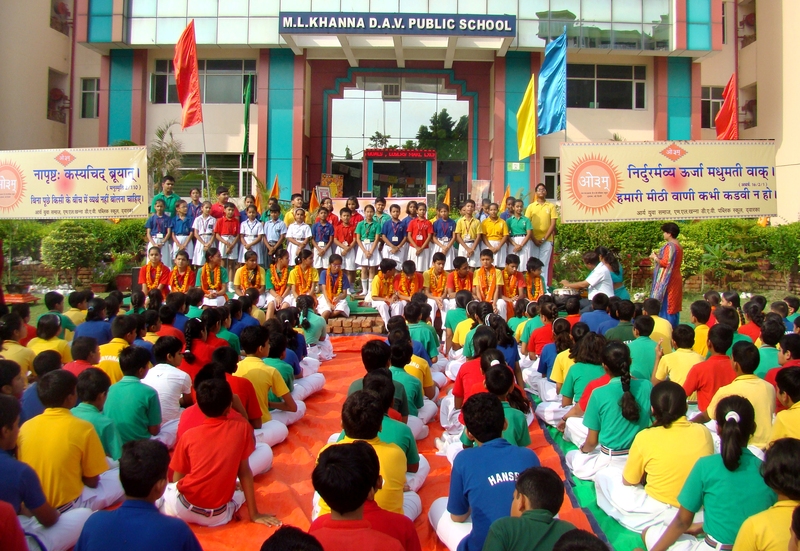 The chanting of vedic mantras sanctified the entire school presence. Principal Ms. Monika Mehan brief the students power of mantras how they pierce through metal and intellectual levels of existence. Prasad brought by students from home were distributed by one and all. 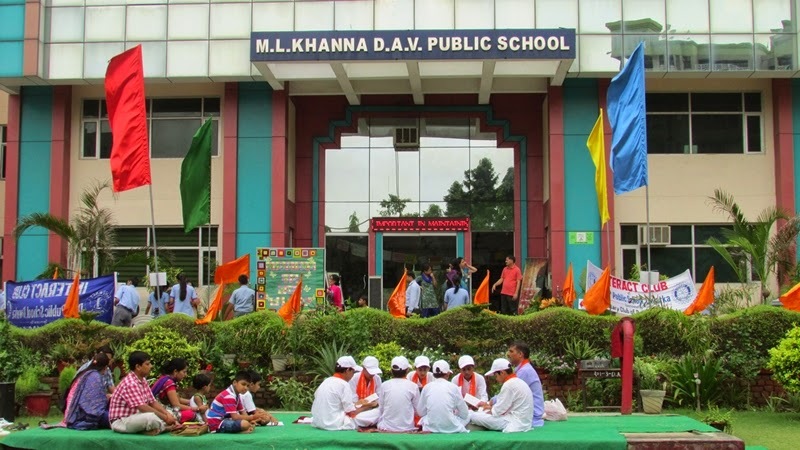 DAV Public School organized Hawan on the fourth Saturday in the school premises on July 26, 2014. All the faculty members along with the Principal attended the hawan ceremony performed by Acharya Pramod Kumar. Everyone present chanted the auspicious mantras and the premises was absorbed by the “AUM” sound and the chanting of vedic mantras. All the faculty members present sought the blessings of the Almighty by giving ‘Ahutis’ in the ‘Hawan Kund’. Acharya Pramod Kumar also emphasized on the fact that performing a ‘Yajna’ is the prime duty of every human being and we should take out some time from our busy schedules to perform it. His informative speech filled one and all with positive energy creating an aura in the environment. Principal of the school, Ms. Monika Mehan enlightened us with her invaluable inputs on working together and sharing our learning with everyone. She highlighted the importance of ‘Satsang’ in our life and encouraged us to Practice what we Preach. To Inculcate values in young minds through chanting of the Vedic mantras, Hawan is performed on every Wednesday by teachers and students.